Sorry I haven’t written to you earlier – we have had our lives turned upside down (in the very best way possible) by our bundle of fluff! Thank you so much for our beautiful Shoodle boy – he is just the best! He is so cheeky, playful and adorable – he has stolen the hearts of all our family and friends. 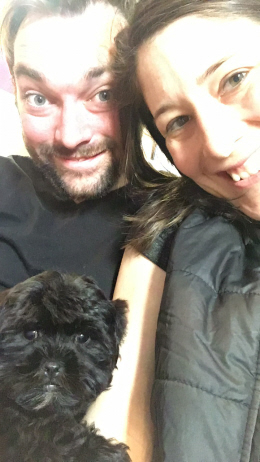 His name is Murphy – I attached a recent photo and our very first family photo ??. He was a bit reserved on the first day, but has since gained confidence and has no issues exploring every inch of our home. He settled very quickly – hardly cried at all, and is now comfortable sleeping alone. Murphy is just the smartest little thing – he has learned to sit quietly, touch his nose to our hands, come (almost) and has an approx 80% success rate on the puppy piddle pads! All in 9 days! Such a clever boy. I want you to know that he has come to a very loving home and we will look after him for the rest of his life. We are looking forward to seeing more of his personality come out as he ages. Thank you for making this process so smooth, the prompt replies to queries and all the advice to prepare us.